I have a tablet based application, that shows folders and files. I did it a bit like Dropbox did. Left view a list of the folders in the current "opened" folder, right view the a list of files in the current folder. Tapping on a folder opens the folder and shows its contained folders. Tapping on a file views the file by hiding the file list and displaying the file content. So it's pretty basic and I think the most important actions work fine like that. Problem is, I got much more actions I can invoke on folders and files. 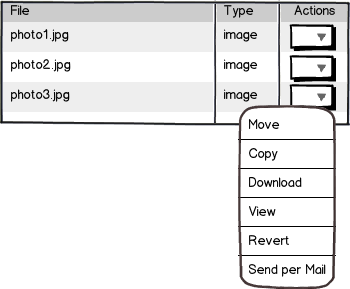 Move, copy, download, view, revert, send per mail, etc. Actions also have permissions, for example, some files have the action "download" some "view" but not all. My first idea was to display the actions in a column besides the folders/files, but it got messy rather quick. Second idea was to let the user select a folder/file and display corresponding actions somewhere else, like in a toolbar above/below the lists, but then I had the problem, that I needed to change the content of the toolbar depending on the available actions and I always wanted to keep my interfaces as static as possible. Are there any other options to display file/folder actions? Most desktop operating systems use a sub-menu in the bar at the top, is this a good way for mobile apps? I didn't see it too often there. I believe mobile version of DropBox actually has what you're looking for. Compartmentalize actions into drop down or popup, based on permissions or context. They are accessed by a right-most [...] or [\/] button, which can be applied to both files and folders. Not the answer you're looking for? Browse other questions tagged tablet actions files folders or ask your own question. When to use the folder-metaphor? Folders and Tagging pattern for a shared files? Is a tag based system a better UX than traditional folder structure?